Sticky notes for Linux : Ubuntu, Elementary OS, LinuxMint and others distribution - For windows computer based machine, there's Sticky Notes to quickly note your work schedule. As a blogger, I need something lightweight application to note To do things and always visible on my Ubuntu desktop, just like the real paper. Then how about Linux based? many Linux apps that you can use to handle this such as Sticky Notes for GNOME, Knotes for KDE desktop, Xpad, Pin ’em up, Tomboy Notes and Sticky Notes Indicator. I'll show you one of them, precisely the last of 6 lists above. 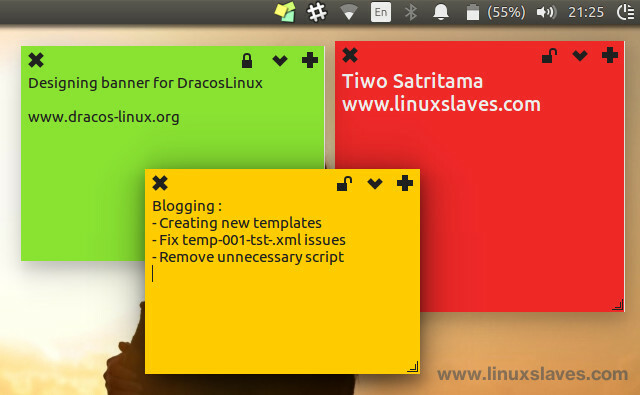 Indicator Stickynotes is a Linux application to help you write reminders that written in Python3 and GTK3. Just like most of the sticky applications, it allows you to make a list do. It works for Ubuntu 14.04 / 15.04 / 15.10 / 16.04, Elementary OS Freya, and Linux Mint series. You can install this app from the developer's PPA, or directly download the .deb package if you prefer to manual installation. Get the installer from the last line of this post. ​Tired of typing the same Linux commands and repeatedly? 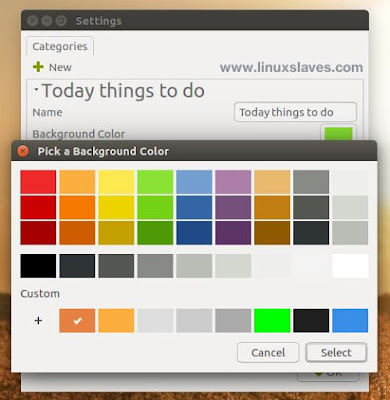 Why not create aliases, a Linux commands shortcut?. Read Bash Aliases : Create Linux Command Line Shortcut. It needs to get 52,2 kB of archives and 284 kB of additional disk space will be used. Once install you can open the app from Ubuntu dash, or slingshot-launcher if you Elementary user. It should be listed as Indicator StickyNotes. This application lets you add categories and each category can have it’s own font, color ( background and font ), font style and size. Export and Import feature are available to help you move the notes between computers. You can change the setting from the arrow-down icon -> Settings. The lock icon functionality to keep the notes from the editable mode. If you need other to do list app with timer to keep your focus, check out our new post Go For It! To Do List App Manager With Timer Feature. That's all I can write about how to Install Sticky Notes Indicator, as a simple sticky note app for Ubuntu, Linux Mint, Elementary OS Freya, and derivatives system. Hope it was helpful for you. Thanks for visiting Linuxslaves!.